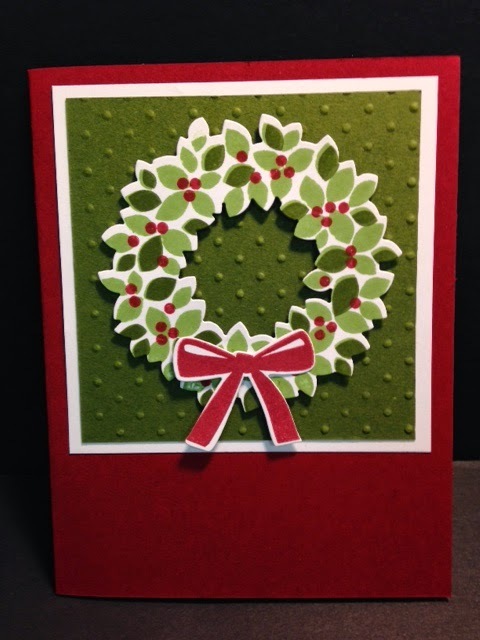 Today I am going to share a card with you that Terri had ready for her downline to make. It's from the new Holiday Catalog (page 9). It even comes with a die and is bundled for a better price!! I think I'm going to have to order the bundle. It's such a simple card wot make. The stamp has a tab on it so you can line it up perfectly every time. We stamped the image using the lighter green, then we used a different stamp in the set and a darker green. You can line up the image perfectly because you can see through the stamp! And then you add the red berries. The bow was stamped and cut out with a die too! No fussy cutting at all!!! I really like this layout and I'm thinking that I may just use it for our Christmas card this year. I usually make a snowman card but after all the snow we got last year, I protested and wouldn't even go out and make one! I was even considering having my snowflake tattoos removed!!! But I didn't!! I promise I won't show you another Christmas card for a while, I know it's a bit early for them but I didn't want to lose this one before I posted it! !